Garis besar: A series of nine scripts which have been adapted a little to harmonize with each other: Attributes of God, Creation and Fall, Judgement, Birth of Jesus, Jesus Can Heal Your Soul, The Gadarene, The Death of Christ, The Christian Life, Living for Jesus. They are all monolog except for section 3; "Judgement" is a dialog. Have you heard about God, the One who made all things? He made the sky and the earth and the sea, and everything in them. He just spoke. He said, "Let there be light!" and there was light. He said, "Let there be earth and sky," and they were made. God is the Creator. He made the whole world, and it belongs to Him, because He made it. God, the Creator, is completely good. He never does evil. There is no evil in Him. He hates evil. God, the Creator, does not change. He is always good, and He is always in control. Can a piece of wood or stone hear? Can it talk? Can it walk? Can it come to you when you are in trouble? Of course it cannot do these things. Evil spirits try to make us think that a piece of wood or stone is a god. In this way they may deceive us. Listen! The Creator God is alive. He can see. He can hear. He can speak. He can go wherever He wants to. He does not need help. This Creator God is greater than all gods. He is the One who made all things, everywhere. He has told us, "I am God and there is no one else." God, the Creator is great. He can be everywhere at once. He has all power. God made everything-the whole big world, and the sky. He made the sun, so burning hot. He made the waters, so deep and cold. If He tells them what to do, they must do it. He made the wind and the storms, and they can't stop Him. God is stronger than a volcano or an earthquake. He made them all. He made all the stars and He knows them all. God is greater than all the chiefs and tribes in the earth. He says they are so small, that they are like the small dust of the air! That is how great He is. He is Chief of all, because He made them and they belong to Him. God can hear everything. He can hear the snake move through the grass; and the ants building their house in the ground. He can hear one man whispering to another. No one can hide from God. He sees you wherever you go. God, knows all things. He is wiser than all the wise men of the world. He cannot be fooled or tricked by witchdoctors or evil spirits, or Satan. God does not make mistakes. He knows all things. He knows all about you. He knows when you are sad, or afraid. He knows what you are thinking. God is a loving God. He loves all people-all men and women, young people and old people, children and babies. He wants all people to know that He is a loving God, and that He is completely good. He wants you to know that He hates wickedness and evil. He wants all people to love Him, and to turn away from their bad ways. He wants all people to turn away from their idols and false gods, and worship Him and nothing else. He is the one true God who made all things. After God made the earth and all things, He created the first man and woman. They were good and God loved them. He made a beautiful garden for them to live in, and trees with delicious fruit to eat. The man He created was named Adam. The woman was called Eve. God loved them, and they loved God. He taught them how to live in the garden and what to do, and they were happy because they did what God told them to do. Do you want to know more about this God Who loves you? Do you want to belong to Him? Listen, and I will tell you more. I will also tell you how I know all these things about God. A long time ago there were no trees on these mountains. No animals lived here. No water flowed in the streams. God made all of these things just the way He wanted them. He commanded them to begin. He said, "Let there be light; and it was light." Then He said, "Let there be rivers, and lakes, and let there be dry ground." Immediately it was so. Next He said, "Green grass, trees and all plants sprout up." Up they sprouted; fruit trees, tomatoes, squash, everything that grows began to grow. In the same way God made birds, and fish, and animals; all that there is, God made by His command [word]. He made people, too. But at first He just made one man whom He called Adam. Later He caused Adam to sleep a deep sleep. While Adam slept God took out one of Adam's ribs and from it made the first woman. God gave the woman to Adam for a helper (to be his wife.) Adam called her Eve. Now God placed Adam in a good place where every kind of fruit grew. He had told Adam, "You may eat of all the trees except that one which grows in the centre of the orchard. Don't eat that fruit." But one day Satan came to the garden. Satan is an enemy of God, and the enemy of God's people. He came in the form of a serpent. 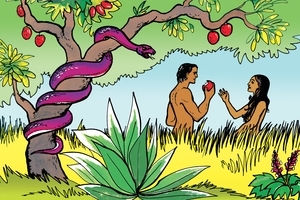 He told Eve that it was good to eat the fruit which God had said not to eat. Eve listened to Satan and thought he was right. She was deceived. She ate some of the fruit and gave some to Adam and he ate of the fruit also. Then they heard God in the garden. They were afraid and hid themselves. God called, "Adam, where are you?" Adam answered, "I hid myself because I was afraid." God asked, "Have you eaten the fruit I commanded you not to eat?" Adam replied, "The woman gave the fruit to me and I ate it." To Adam God said, "Because you disobeyed me the ground will not produce abundantly for you. It will produce thorns and thistles. You will work hard and earn your living by the sweat of your brow. Later you will die and return to the ground from which I made you. You will no longer be My close friends. This is your punishment." Then God sent Adam and Eve out of that good place where they were living. He did not allow them to live there any more. They had to find a place to grow their food. Life became hard, and God seemed far away. They knew they were going to die. My friends, we are like Adam and Eve. We disobey God's Word. We do many other things that displease God. We too deserve to be punished. The punishment for Adam and Eve is also our punishment. But God loves us, and He has a plan to rescue people. He sent His Son, Jesus, to live in the world, to make a way for us to come back to God again. Jesus received our punishment. He died for our disobedience, but He came back to life. He took the punishment we deserved, so that we will not have to suffer. If we trust Jesus, God will receive us. You can talk to God. You can thank Him for sending Jesus to help you. Now I will tell you more about God's judgment and His rescue plan. Here is a conversation in the village. (Start with voices in discussion). 1. Did you hear all the discussion? 2. Yes, I have been listening to it all day. 2. The chief is very just, and also the elders. The man we are talking about is certainly guilty, and his offence is very serious. 1. Is it true? What is the penalty? 2. The penalty is very heavy indeed. And the man is not able to pay it. However, it is just and right. 1. Very sad. I guess this man will have to be under the burden of this debt for many, many years - the rest of his life perhaps! 2. Yes. That would be the case, I'm sure. This man also seemed very sad because he confessed that he did wrong, and also that the judgment was fair. But he did not know how he could pay it. Then suddenly an elder stood up and spoke. He told the chief that his heart was heavy to hear about the wrongs his friend had done. He also told the chief that the case was judged correctly, and that the wrong would have to be paid for, regardless of whether the guilty one was rich or poor. Then the man said this: "But because this guilty one is my friend, and I love him, I wish to pay the price of his judgment. He cannot pay, but I can." 1. Ayy!! Is it true? 2. Yes, it is true. And the guilty man was amazed, and he felt very humble to think that his friend would be so good! But he agreed, and the chief ended the business. 1. Do you know, friend, this is a picture of each one of us. God's Word teaches us that each of us stands before God, the Great Chief. And He sees our hearts. He knows that we are sinners and guilty. His just penalty is everlasting punishment. What can we do? How can we escape God's penalty? We could never pay the price. God knew this, and therefore He sent His own Son to bear our judgment for us. You remember I told you the punishment was death. To take our punishment, God's Son died on a cross as a sacrifice for sin. And now if a guilty sinner agrees to accept this payment for his sins, he is freed from judgment, and that terrible punishment for sin. God's book tells us, "Everyone has to die, and after death there is judgment." Then there is a second death which is terrible indeed. But my friend, God has provided a way out for all of us if we will trust in Jesus' death for us. God's book says, "How can we escape if we don't do something about the great salvation God has offered us?" There is no escape. Will you now put your trust in Jesus and receive Him as your Saviour from God's judgment? Let me tell you some more about God's Son, Jesus. God's Book, the Bible, tells us that before Jesus came to this world, He was in heaven with God. When God made the world, Jesus helped Him. Then, much later, He came to the world in the form of a man. Now I will tell you how it happened. There was a young woman named Mary. She was not married and she had never slept with a man. She was planning to marry a man named Joseph. Before they were married God sent an angel to talk to Mary. When the angel came to her, Mary was afraid. He said to Mary, "Don't be afraid. God is pleased with you. So God is going to give you a son. You do not yet have a husband, but God's own Spirit will put the child in you. His name will be Jesus. He is going to save the people from their sins." That's what the angel said. Then Mary said, "How can this be? I have never slept with a man." The angel answered her, "This will not be the son of a man. For that reason you will call him 'the Son of God.'" Then the angel left. Mary believed what the angel had said. Afterward she went to another town and stayed there three months with some relatives. When she returned Joseph saw that she was pregnant. He was troubled and planned to leave her. But the same angel came to talk to him. The angel said to him, "Don't be afraid to marry Mary. She is pregnant because of the Holy Spirit. When the child is born, give him the name Jesus. He is going to save the people from the punishment of their sins." 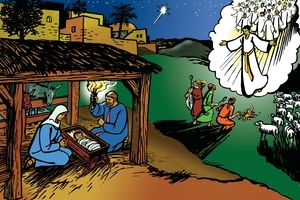 Then Joseph married Mary, but did not sleep with her until after Jesus was born. Jesus grew up, and when He was 30 years old He left the house of His parents. He began to go from town to town teaching God's message about salvation. He healed many sick people. He made the lame to walk, and the blind to see. He made the deaf to hear and the dumb to talk. He sent the demons out of people who were controlled by them. He could do this because He was God's Son. When He helped people in these ways, they could see that He had God's power. Some of them believed that He was God's Son. Jesus saw their sinfulness, but He loved them. Because of His love He was willing to die for all people. By dying He made payment for our sin. He wants people to believe that He is the One who can save us. Believe in Jesus. He has power to free you from Satan and all evil spirits. He will do it for you if you ask Him. Talk to Him now. He will hear you. The Bible tells us that Jesus was God's Son. He came to earth to rescue people from their sin. Because of this He is called "the Christ." That name means "the one God has sent to rescue us." On earth, He did many wonderful things. When people were ill, He healed them. He told the people about Heaven and about God's kingdom. One day there was a blind man sitting by the roadside begging. (pause 3 sec. *) He knew that he could never be cured of his blindness. Only God could heal such a person. Suddenly he heard a crowd of people approaching and someone shouted, "Jesus is coming!" Now this blind man had heard about the wonderful things that Jesus did, and he believed that Jesus was truly the Son of God, for only God could do such great works. When the crowd came near, the blind man called out, "Jesus, Jesus! Have mercy on me!" Then Jesus stretched out His hand and healed him. After that he could see everything. He loved Jesus and followed Him. At another time some lepers were calling, "Unclean! Unclean! Keep away!" Lepers were people with a skin disease that could never be cured. They were full of sores. When Jesus saw them He felt sorry for them and healed them. They were so happy to be well and strong again that they went away running to their homes. But they forgot to say "thank you" to Jesus. Only one of them remembered to return and say "thank you." When he worshipped Jesus and thanked Him, Jesus healed the sin in his heart. Jesus lived on earth for 33 years, but the chief men hated him because He loved God more than they did. They arrested Him and killed him by nailing Him on a cross. There He bled and died. He was God's Son but He was willing to suffer and die for us so that we could be saved and go to heaven. "Dear God, I am a sinner. But I am sorry for my sin. I do not want to do wrong any more. Thank You that Jesus died for me. Please take away my sin and make my heart good. Help me to live your way. This I ask in Jesus' name. Amen." Did you mean that prayer? Then, God heard you. Sin is like a disease which is eating inside of us. If we invite Jesus to be our Master then He will heal the disease inside of us. He makes our hearts good and gives us strength to follow Him in His good way. Say to Jesus, "Thank you for saving me. Thank you for healing my heart." Then be sure to tell others what Jesus has done for you. Here is another true story from Jesus' life. Jesus and His followers went in a small boat to the country of the Gadarenes. As soon as Jesus got out of the boat, a man with an evil spirit saw Him. This man did not live in a house, but in the place where they bury the dead people. He didn't wear any clothes and he was very wild. The village people were frightened to go near him. 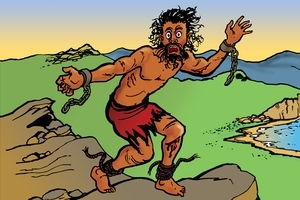 Some men had tried to tame this man by putting chains around his arms and feet, but he broke them. No man could tame him. All the time, day and night, he made terrible cries as he cut and beat himself with stones. This man was ruled by Satan's evil spirits. Jesus came to help this man. 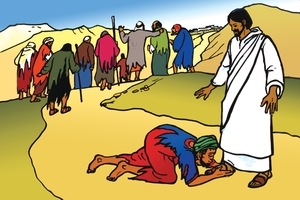 When the possessed man saw Jesus a long way off, he ran and knelt down before Him. Just as Jesus was to send out the spirits from this man, a spirit inside him shouted out very strongly, "What are you going to do to us? We know you! You are Jesus the Son of God! Promise us by God that you will not send us to the place of torment yet." Jesus asked the spirit, "What is your name?" He answered, "My name is 'Legion,'" which means, "many." Then Jesus commanded all the spirits to go away from the man. They entered into a large herd of pigs. The pigs rushed down the hill into a lake and were drowned. In our country, too, there are many evil spirits. Satan is like a poisonous snake on the trail who waits to strike (harm) you. Jesus came to this world to destroy the things Satan wants to do. Although there are many evil spirits in the land, Jesus is not frightened of them. Jesus is powerful. He came to free us from the work of Satan. The evil spirits know who Jesus is and they are frightened of Him. They know that Jesus will banish them. Satan and his helping spirits are afraid of Jesus. You should watch out for the ways of Satan and evil spirits. Ask Jesus to help you. Jesus has defeated Satan and everything he does. Pray to Jesus and ask Him to take away your sins. He has power to do this and to rescue you from Satan. He will make you His son or daughter. He will never leave you if you always trust in Him. Did Jesus, the Christ, really die? Is the story of His death true? There is no doubt about this. Many years before Jesus came, the prophet Isaiah said this about Him: "He has made His grave with the wicked." Yes indeed, the Christ died by the hand of men; but God sent Him for this purpose. He came to the earth to pay for the sins of the people. People who believe this and turn away from their sin will not have to pay for their sins, themselves. God said there is no salvation unless someone without any sin dies in our place. In that way, the payment could be made for our sins. We cannot make the payment, because we have sinned. Christ is the only One who is without sin. He is the only One Who could make this payment. He accepted the debt of our sin, and paid it with His death. He exchanged His life for our sins. How did it happen that He died? At that time the chief man was Pilate. The others arrested Jesus and brought Him to Pilate. Pilate questioned Jesus and then decided, "I find no fault in this man. I will punish Him and let Him go." But the leaders answered, "Many people are following this man. If you let Him go, you will not be the king's friend." When Pilate heard these words, he was afraid that he would make the king angry. So he said, "Take Him yourselves and judge Him, because I find no fault in Him." Then He washed his hands and said, "I am not to blame for this man's death." They took Jesus from the court of judgment and beat Him. He did not say a word. They made Him carry a big wooden cross to the place where they were going to put Him to death. All the people followed Him. Could He not save Himself from His enemies? Of course He could, but He knew the prophet had written about Him, "He was killed for the sins of my people." They nailed Him to the cross with His arms stretched out. Then they lifted the cross up. Jesus hung there with nails through His hands and feet, and His back bleeding from the beatings. Listen to what He said. "Father, forgive them. They do not know what they are doing." He asked God His Father to forgive His enemies. When Jesus died, the country was in darkness. There was an earthquake and many dead people came to life and went into the city. Many people saw them. Jesus' enemies thought they had conquered Him because He had died. Friends used a cave to bury His body, and they put a great stone at the door. The people who crucified Him put soldiers there to guard it. Jesus knew that God wanted Him to die so that He could take our punishment. He said, "I have the power to lay down my life and I have power to take it again." Jesus did not stay dead. I told you that He did not deserve to die, because He had no sin. Death could not hold Him. On the third day after His death, God raised Him from the grave. Many people saw Him alive. At one time 500 men saw Him. He was not a spirit. One of His friends named Thomas did not believe that he was really alive. One night, Jesus came to them and said to Thomas, "Put your finger into the holes in my hands where they nailed me to the cross, and do not doubt, but believe." After He rose from death, Jesus was on earth for 40 days. He talked and ate with His friends. He gave them this instruction, "Go and tell all people everywhere what you have seen. Tell them that they need to turn away from their sin and accept my death for them." Then they saw Him rise up from the earth and go back to be with God. From the beginning God promised that one day the Saviour would come, and that He would save the people from their sins. Now He has come, but many people did not know Him because He did not come as a great king. The person who receives Him and follows Him now is truly happy. Jesus will not refuse those who come to Him. Pray and ask Him to receive you. He will hear you if you talk to Him. Jesus is alive forever. God said in His Book, the Bible, "He will not rot in the grave." Jesus arose from the place of the dead and later ascended into Heaven. Some day He will return from Heaven to judge the world. God's Book says that God has appointed Jesus to be the judge at the last day. If you refuse Him now, He will refuse you then. If you turn away from your sin and receive Him now, He will take away your sin. When you die, He will take you to live forever with Him. Believe in Him now. Would you like to know what it means to be a Christian? Life is like a broad road crowded with many people. Each person carries on his back a heavy load of sin. The Bible says that "All have sinned." (Pause) Above the noise of the world around us, a voice calls out, "Come to Me, all you who are heavy laden, and I will give you rest." Some people take no notice and keep walking along the road. Does anyone hear? The voice calls out, "Come out from among them and be separate. Do not touch any unclean thing. I will receive you and will be a Father to you, and you shall be My sons and daughters." (If possible insert part of an invitation song here.) A few people stop to listen, but then go on. Finally, someone in the crowd turns to listen. For a moment he is undecided; then he leaves the crowded road and steps into a narrow path and begins walking in the opposite direction. People on the broad road ridicule him, saying, "You'll never get anywhere in the world, on that road." The man does not care, he laughs; for the terrible load of sin has rolled off his back and is gone. The old habits and sinful pleasures are left behind. (Sing all or part of song "Rolled away, rolled away", or "Gone, gone, gone," etc.) At first he thinks he is alone on this narrow road, but Jesus, the Lord, comes near and walks with him. He fills this man's heart with such a joy and peace and contentment that he could never want to return to the life of sin. God puts His Holy Spirit in his heart so that the man knows he is a child of God, a believer. You, too, can become a child of God through believing in the Lord Jesus Christ as your Saviour. When you have done this, what a new and wonderful change He will make in your life! "Therefore if any man is in Christ, he is a new creature: old things are passed away; behold, all things have become new." Listen to His voice: "I am the Bread of Life; he that comes to Me shall never hunger, and the person who believes in Me shall never thirst." "Today if you hear His voice, do not harden your heart!" My friends, let me ask you a question. Are you a Christian (follower of Jesus)? Perhaps you are saying, "Yes, we are all taught to be Christians here." But let us look inside our hearts. Have we truly believed in Jesus with our hearts, or do we just believe with our heads? Are we trusting in what our parents have done for us, or in the good things we have done? Or have we asked God to cleanse our hearts and to make us His own children? Let us be sure that we are on the road that leads to God's home. When a person opens his heart to receive Jesus as His Lord and Saviour, many good things happen to him. At that moment all his sins are forgiven. The Holy Spirit comes to live inside him and helps him to do what is right. He becomes a child of God. God becomes his Father and helps him and cares for him. We should always love Him and trust Him even when we have sickness and trouble. God is with us all the time, loving us. We should thank Him for the things that come to us because He knows they are good for us. These hard things teach us to be patient and kind. God showed His great power when He raised Jesus from the dead and made Him live again. He wants to help us with this same power. With His power He will help us to do right. Even when the devil tries to make us do wrong, Jesus will help us to do right. We should show by our lives that we are His children. He makes us like new people who can follow in His good ways. God showed His love for us when He gave Jesus, to die for us, even when we were not His friends. His Spirit in our hearts can give us His love, so that we can love other people who are not kind to us. God wants us to be like Him in all these things. He says in the Bible, "Love your enemies and do good to those who do wrong to you." If you do this, people will see that you are truly God's child, because you have His love in your heart. They will want to follow Jesus too. It is very important for us to obey God's Word, and therefore it is important to know what He says. We should learn His Words from the Bible and think about them, and every day we need to take time to talk to Him. This is the way we can really come to know Him, and grow in Him. He doesn't want His children to remain like babies, but to become strong in Him so they can be a help to others. There are many things to talk to God about. We should thank God for giving Jesus to die for our sin. When He did this He defeated Satan and paid the price for the sin of all who believe in Him. When the devil comes to tempt us to do wrong, we can refuse him through the blood of Jesus. When we do this, he must leave us. If at any time you disobey God, you will be very sorry, but do not be discouraged. Quickly ask Him to forgive you and trust Him to cleanse your heart. Ask Him to help you not to give in to the devil's temptation. We should thank God for the many good things He does for us, and also for the hard things. He says that He will make everything work together for good, if we love Him. We should also pray for people who have not given their lives to the Lord. (If we trust God for this, His Spirit will talk to them). We can pray about our problems and our troubles. He wants to help us with everything in our lives. He will answer every prayer that is in His will, but He knows what is best for us. If He does not do what we ask, it shows that He has some better plan. As we trust Him, He will bring more and more joy to our hearts, and we will learn to believe Him for more important things. The Christian life is being right with God, and having peace and joy in our hearts every day. God bless you as you follow Jesus. GRN has recorded a version of this script in 101 languages and dialects. See full list. See different versions of this script in Chinese Simplified.